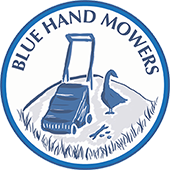 At Blue Hand Mowers in Denbigh, we carry out service and repair of garden and construction machinery. Our honest, highly experienced and skilled engineer will always do his best to repair your machine but will also let you know if a machine is not a viable repair. Servicing your garden equipment regularly almost always results in cost savings in the medium to long term and perhaps more importantly removes the frustration and time wasted when things don’t work as expected.